Being Creative — Watershed Productions Inc. 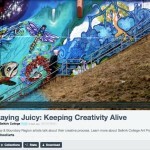 Check out this new video put together by Bryan Webb for Selkirk College on the creative process and keep inspired as an artist and person. Amy Bohigian is one of the Kootenay based artists interviewed. Posted on December 4, 2015	in Resource. Bookmark the permalink.